Just a little weather update. We had some cooler days this week and today, rain 🙁 Well I am not really too sad, we need it. Let mother nature water my plants and grass instead of wasting water reserve. The forecast shows a fair weekend then maybe more rain next week. “Arrived in -the unit-. Unloaded supplies then tried to fix broken intersection blue LEDs on -the unit-aka Tahoe. Built fire in firepit. ..standby with 2 ABC dry chem fire extinguishers, structure gloves, turnout pants.” “ATVing from 0800-1500 hrs on Polaris and BRP ATVs. BRP had winch. Mud was fun. Rain/cold was not. Dinner at close restaurant. Returned home to construct another fire. Did some PT (Physical training). Sleep. Leaving in the morning ➡ 7 hour drive. I hope you enjoyed reading this. 2 chairs are waiting for you! Memorial Day is a time to recognize our military who have served for our country. But the weekend also seems to be a time for families to get together. This year, we had in beautiful weekend in Jackman, except for some windy days. 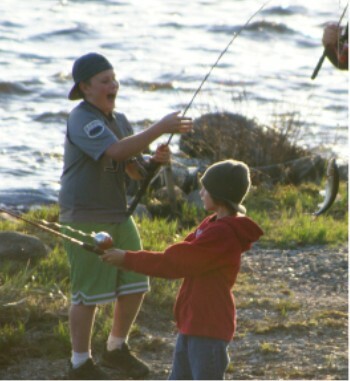 One evening, all the kids and others were fishing right off shore. I am not sure if this fish was a keeper but it was great fun for them. summer. Just bring along a copy of your discharge or report to duty papers. 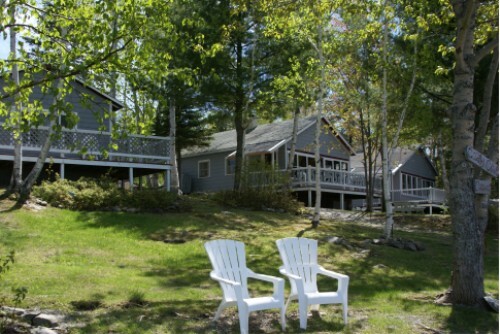 Mom, Dad and 3 children for $128.00/night. due. This option is not available with any other discount or special. year at our regular rate and we will take 50% off your 5th visit. For those of you who have noticed that our webcam shot is stuck on Fridays snapshot, not to worry…we are not broken, well at least the webcam is not. Our Modem is down. A new one was to be sent on Friday but seems that it is coming by [i]pony express [/i]:lol: cause it is not here yet. SO just let me say, you have not missed anything on the lake all weekend. It was cold, windy and rainy most of the time. But today…it is simply BEAUTIFUL out there. A gentle breeze, blue skies, and the float plains must be doing some training as there are 2 or 3 of them taking off and landing. In case you were not awake at 8 this morning and looking at our Web-cam, this is the snapshot of what the day was to be. What a beautiful day it has been…. Granted, I am sure they did not see 80 [i]different[/i] moose but I suppose it is hard to tell unless you start naming them 😆 or tie a ribbon around their neck. Either way, it is something they enjoy doing a few times a year and then they come back to the cabin and enjoy the serenity. 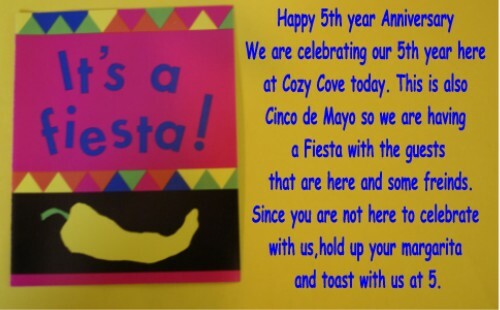 An added note: They also celebrated their wedding anniversary with us on the 5th. And may they have many many more. 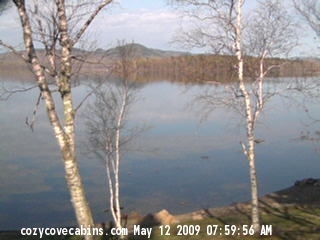 Steve and Tami came to Jackman and Cozy Cove Cabins on May 5th 2004. SO today it is five years and since that falls on the 5th day of the 5th month, we need to celebrate. This was the best move we ever made and hope to be here for many more years. We are so thankful to the community, our friends, our family, and especially our guests both new ones and those that keep coming back. Without you, we would not be here. It did not take long for the boats to get out on Wood Pond to do the spring fishing that all have been waiting for. I saw at lest 4 different boats out this morning. I got a call the other day from a gentleman in Boston asking how the weather was and if the ice was out. It was really hard to answer him since every day this week, it has been completely different. For the most part, the skies were blue and each day started out cool but warmed up to 50 and even 80 at one point but then I believe it was 30 one night. SO in other words, one day, I was wearing shorts (:shock: are my legs white) and then the next day I had a long sleeve shirt and a sweatshirt on. Today it is raining and a bit dismal although it is not very cold…maybe 60? So if you are looking for perfect temperature to do your spring fishing, you are going to have to take your chances as it seems, this spring is going to bring us variations all month.